Mestre Carioca, was born as Carlos da Silva Borge in Saquarema, Rio de Janeiro, Brazil in 1968. At the age of 10 Carioca started to play capoeira. After high school Carioca dedicated his life to Capoeira. "At the time I was playing both capoeira and soccer. I needed to decide what sport I would dedicate my life towards." Carioca trained in Bom Jesus and Vila Velha, Brazil with his first teacher, Professor Bom Jesus. In 1990, Professor Bom Jesus left Brazil to teach in New York. Carioca then went to Vitoria to train under the very skilled and respected master Capixaba of the ABADA-Capoeira group. Carioca started teaching Capoeira in 1990 as a graduado. In Brazil from 1991 - 1996, Carioca gained his reputation as a Capoeirista teaching at several Brazilian gyms including the well known club of CEG (Garoto Sports Center). In 1992 Carioca was involved in a program for street children with the Espirito-santense Institute of the Well-Being for Minors Organization (IESBEM) where the use of Capoeira as pedagogical, artistic, and cultural resource rescued many children from the hardships of streets in Vitoria, ES. In 1996 Carioca taught capoeira at public schools and communities thru the state department of Culture in ES, Brazil. During the months of November and December that same year Carioca was invited by the Cultural Department of the Reunion Island on a cultural exchange with the masters of an art form of Moring to teach Africans Capoeira. To celebrate the 1996-1997 New Years Eve Carioca performed capoeira in Paris, France. In 1997 Carioca left Brazil accepting a proposal in Texas to work on the children’s after school programs. He taught capoeira at more than 20 public schools and communities thru "Project Bridge" in Texas. Carioca then went to New York City in 1998 to act as a substitute capoeira teacher for Professor Bom Jesus. The experience and new opportunities opening from teaching in New York City convinced Carioca to stay and live in the Big Apple. In 1999 Carioca performed at the Victory Theater N.Y.C. with the "Force of Nature" Company. At the end of 1999 Carioca performed on New Years Eve at the World Trade Center "Windows of the World" famous restaurant with the performance company "Samba Novo". During the summer of 2000, Carioca performed capoeira and samba at Sean "Puffy" Combs, aka P.Diddy (famous rapper and fashion designer) private party at his home in South Hampton, New York. Later that year Carioca performed capoeira at a private party at Yale University for Govenor Pataki. In May - June of 2001 Carioca was on Nike.com's website. Nike aired an alternative sports video in which Carioca and Boca Do Mundo were featured playing capoeira. In the summer of 2001 Carioca performed capoeira and samba at rock star and actor Jon Bon Jovi's private party at his home in New Jersey. In November he performed capoeira and berimbau music at the Guggenheim Museum in New York City with "Roots of Brazil" dance company celebrating 500 years of Brazil. In addition Carioca did demonstrations to children in grade school at the Guggenheim Museum. Throughout 2001 Carioca continued teaching and performing capoeira workshops with Bob Thompson at Yale University. Carioca's performances and workshops at Yale University began in 1999 and are planned to continue thru 2003 and beyond. In March of 2002 Carioca was invited to give a capoeira performance for a private party at the home of superstar Diana Ross. Carioca performed dozen of times with "Samba Novo"during 2002, including a special performance for the Volkswagen corporation, and continues to work with the performance group on new pieces of work. Another Brazilian performance group Carioca has done a lot of work with has been "Ginga Brasileira”. This union will bring future scheduled events well into 2003 and beyond. Other key performance at prestigious parties and events has been for a private party of billionaire Bill Gates at Ellis Island Immigration Museum in November, exclusive New York City hotels Trump Plaza, and the Hotel Pierre during the December holidays. Carioca had more appearances in 2002, one being at a private party Noche Caliente, and at The Katonah Museum of Art. located in upstate New York. It was also during 2002 that Carioca was granted approval by the U.S. government for permanent residence, based upon his life's work within capoeira and as a performance artist. In 2003 so far, Carioca has had the opportunity to shine his physical and musical skills for Mardi Gras Galveston, held in Texas, including shows on the side stage of the beach during that celebration week. While down south, he performed at the Holiday Inn, to further share his traditional Brazilian art. Not to mention, a show at New York City's legendary Brazilian Copacabana Night Club. All the while, having the opportunity to teach at numerous schools across the United States, on an elementary level thru to state universities, including Yale University and cultural after school programs, until this present time. In addition, Carioca has received more media press appearing on NBC's "Good Morning America", and NY1's latino coverage of this hispanic art. Carioca's four New York City batizados were spectacular events that further strengthened Carioca's ultimate vision. Just recently, on Dec 13th 2003, Carioca was promoted up in rank, not 1, but 2 cordas, to Professor at the most recent batizado! This is a prestigious rank in capoeira. Instrutor Onça (own-sah) was born in Dillon, South Carolina. At a young age, he has always wanted to do Capoeira. Unfortunately, there were no schools in South Carolina at that time. While attending school at the College of Charleston in Charleston, SC, capoeira came. 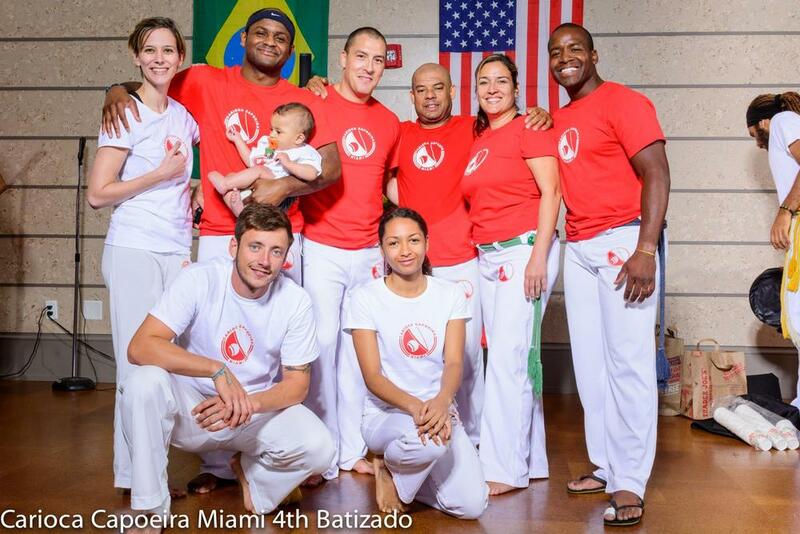 He began training capoeira in 2005 under Professor Queixo, a student of Mestre Carioca and Mestre Bom Jesus. He graduated with his Instrutor (instructor) cord in 2012. He has several years teaching kids and adults. At 10 years of continuous training, he gained valuable knowledge about the art Capoeira, and its disciplines, from traveling and training with Mestre Carioca and Mestre Bom Jesus in Vila Velha, Brazil and throughout the United States. He also participated in his first Capoeira Games competition in New Jersey at Boca Capoeira where he won 1st place in Advance Division, and Best Benguela, Angola and Iuna games. In September 2015, he moved to Baltimore, Maryland to be with his wife, Marinheira, who also trains Capoeira. They have one son, Oncinha, who is a future capoeirista. Carioca schools are in NYC, Charleston, SC; Miami, FL; Baltimore, MD; Savannah, GA and Columbus, OH.